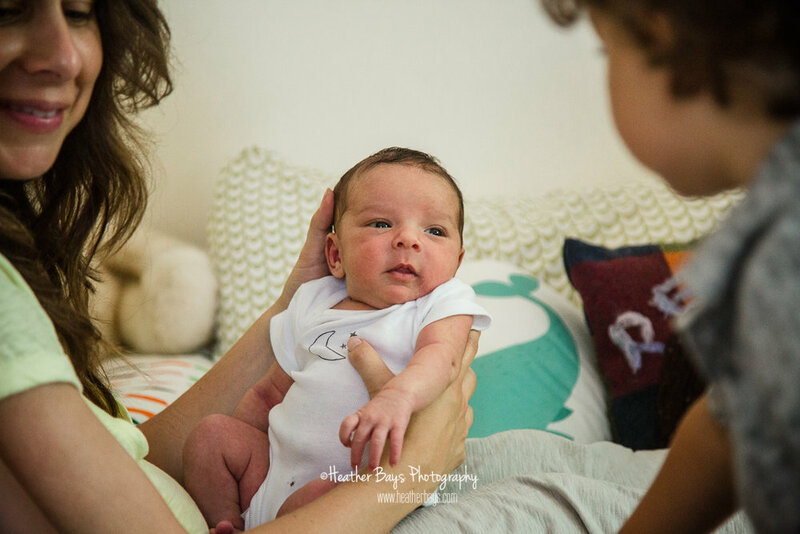 Heather Bays is a Toronto Ontario family newborn maternity and birth photographer specializing in artistic lifestyle and documentary style photography. When people contact me about documenting their baby’s birthing day the first thing we do is set up a meeting to chat and get to know each other a little more. After we chat we do a little complimentary mini maternity session. This gives you a feel for what it’s like to be in front of the camera and allows you to see yourself in my images before you commit to having me document this momentous time in your life. There are no retakes when in comes to birth so you need to be confident in who you are trusting to document such a life changing experience. I always recommend you contact me early, like as soon as you realize you want your birth documented, because with the nature of this type of photography I can only take 2 births per month and I need to keep them spaced by 2 weeks to be fully confident that births won’t overlap. This means my birth schedule is often booked up. However, if you contact me last minute when you are nearly full term, there’s a chance I can fit you in because sometimes the mama who is booked for the same time you are due already had her baby which opens up the spot. For example, the first family featured below was my early March mama, and baby was born yesterday! So, if you are expecting your baby between now and mid-March and are looking for a birth photographer, you are in luck because a spot has opened up! Contact me ASAP! Now scroll down to see a bunch of recent mini maternity sessions at different stages of pregnancy (and different times of the year). Most of these babies have been born, and some of these babies are still cozy in the womb for just a little bit longer. Please view the maternity gallery to see more adorable baby bumps! To see Birth Stories, head on over to the Birth Gallery. I spent an afternoon with this rad family. You may remember a few years back I documented the day Attis was born, so it was really wonderful to see Attis so welcoming to his little sister. He played music for her and read to her. He was also so incredibly loving mimicking his dad caring for his mama, making sure she was fed and cuddled. Ya know, a lot of people might think having a photographer spend half a day with you while you have a newborn could be too much, but actually, it’s way less stressful and more casual than a Lifestyle Portrait Session. You just go about your day doing all the things you would normally do and I can be a fly on the wall capturing all the sweet moments and messy moments and funny moments. Basically just capturing your perfectly imperfect real life. These Day in the Life sessions are my favourite type of session. I love them because they are so real and honest. They also come with a super sweet family film. So scroll down and enjoy half a day with Elise and Attis. To see more sweet Films, head on over to the Film Gallery. And to see more Day in the Life sessions, head on over to the Day in the Life Gallery.